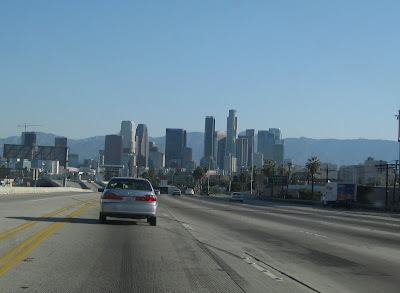 My Wandering Life: I Love L.A.
Driving through downtown Los Angeles always has a calming effect on me- I am a city girl through and through. In college I was always hanging around the fabric and garment districts around 9th and Maple, picking up cheap threads or material to make my own. My Dad worked in Downtown while filming and I always used that as an excuse to go into the city. The boys think that somehow we've been "transported to another dimension" named "Hong Kong" when we drive through the tall buildings reminiscent of the Hong Kong skyline. Wouldn't it be nice to skip the 14 hour flight and instead just take a 14 minute drive?